Gion’s Uokeya U is a restaurant famous for their dish called Uoke, unagi eel rice bowl that is served in a wooden bucket. The restaurant is located in the luxurious district of Gion, one street west of the Hanamikoji street. Uokeya U is listed on the Michelin Guide for 2017 as a one star restaurant. You can tell from just looking at the restaurant building that the restaurant is a dignified one. The dynamic lettering on their sign with the hiragana letter う(u) written so that it looks like an eel, the water tank covered with moss under the sign, and the renovated 100 year old town house the restaurant is located in are all refined and tasteful. The main thing that separates Uokeya U from other restaurants has to be their specialty, the Uoke bucket. The cedar bucket is filled tightly with rice and then topped with kabayaki sweet soy-sauce unagi. There are not many dishes that look as luxurious and breathtaking. The rice that has soaked up the sauce and the unagi eel have a strong but not overpowering taste. It tastes so good that you just can’t stop eating! If you are in Gion please experience Uokeya U at least once. While sightseeing in Gion, we recommend you take an unagi break to have some eel in a bucket. Uokeya’s specialty, Uoke. When the dish is brought to your table and you open the lacquerware lid and see the glistering kabayaki-style unagi, you have to give a shout of delight. The unagi is steamed before it is grilled so it is really fluffy and soft, while still retaining the fragrance you get from grilling over charcoal. The bucket is full of unagi so this is really the ultimate extravagance. Uoke portions start at a portion big enough for three people so it might be wise to go to Uokeya with a group of people. 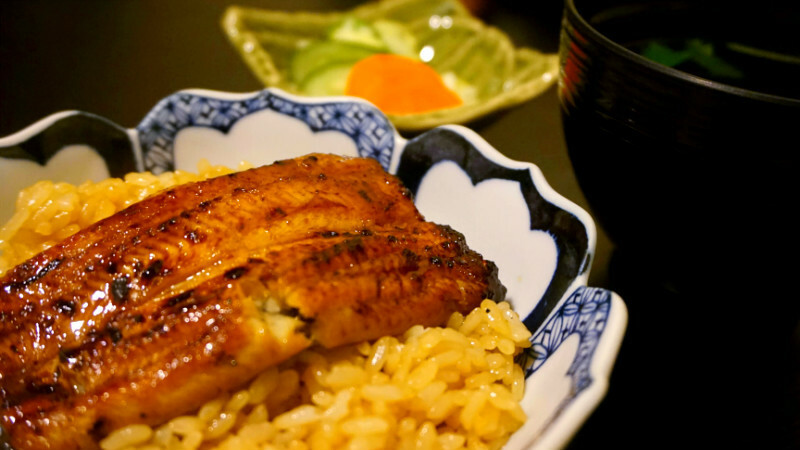 “Kimo yaki” is said to be the most extravagant way of eating unagi. This is because in order to make one skewer, you need the guts of many eels. Kimo yaki is unagi guts marinated in a sauce and then grilled. To make one skewer like in the picture you need the guts of many eels. Compared to the guts of other animals, the taste of unagi guts is really light. The tender, mild tasting unagi guts are a sure hit with those wanting to have a drink with their eel. “Umaki” is unagi rolled inside a Japanese omelette, and we definitely want you to also try this, of course your tummy permitting. The thick omelet is jiggly and voluminous. The omelet is made with dashi soup stock you don’t need to add anything. After eating half of it, I recommend you add a little bit of soy sauce from the bottle on the table. After ordering kimoyaki and umaki, it is time to order some sake. Unagi is a traditional Japanese dish, so a traditional Japanese drink, sake, should go well with it. Sake will make the flavors of the dish stand out, make them richer. For this reason I strongly recommend you order a cup of sake! Uokeya U has a good selection of sake. They can also choose the sake that goes best with that particular dish for you, so it might be a good idea to leave the choice to them. With the dish Uoke the restaurant staff will help you for your first serving. You probably should eat the first serving as is, but I recommend you put some Japanese pepper on the second one. Unagi and Japanese pepper go really well together. You can enjoy the change in the taste that the Japanese pepper’s hot bite brings. The Japanese pepper is in a cylindrical container. If you take out the peg on top of the container, you can shake some Japanese pepper on your unagi. Just be careful not to shake it too much, otherwise your unagi will taste of nothing but Japanese pepper! Uokeya U is a popular unagi restaurant in Gion and is popular with locals and tourists alike. Their signature dish, the Uoke is delicious but it also looks amazing. The portions of the Uoke are big, and start at a portion enough for three people so we recommend you go there with your family or friends, or a big appetite. Take a picture of the Uoke and impress your friends! 7-minute walk from Keihan Line Gionshijo Stn. They have a menu in English and Chinese, and the staff can speak some English.